Most horror games can be categorized under "story-less", "bloody", or "story-less and bloody", but Alan Wake was one that did not fit under either. In fact, enemies don't even bleed in this game, and the story happens to be very well told. Without spoiling anything, Alan Wake is a thrilling tale of an author who goes on a vacation with his wife in order to escape the pressures of the city, only to find on the first night that she had been kidnapped by some force of evil. Instead of bleeding, they explode in your face, seriously. Over the course of the game, the protagonist runs around an unbelievably detailed environment with a flash light, some small firearms and a very small supply of ammo in an attempt to find exactly what happened to his love. Unlike most story-focused games, Remedy Studios has managed to incorporate much freedom during game play, mapping the environment so that you always have the option to take a different path to complete your objective. Although this game was not exactly the most terrifying game to play, it definitely did a good job of presenting the player with a variety of scares. 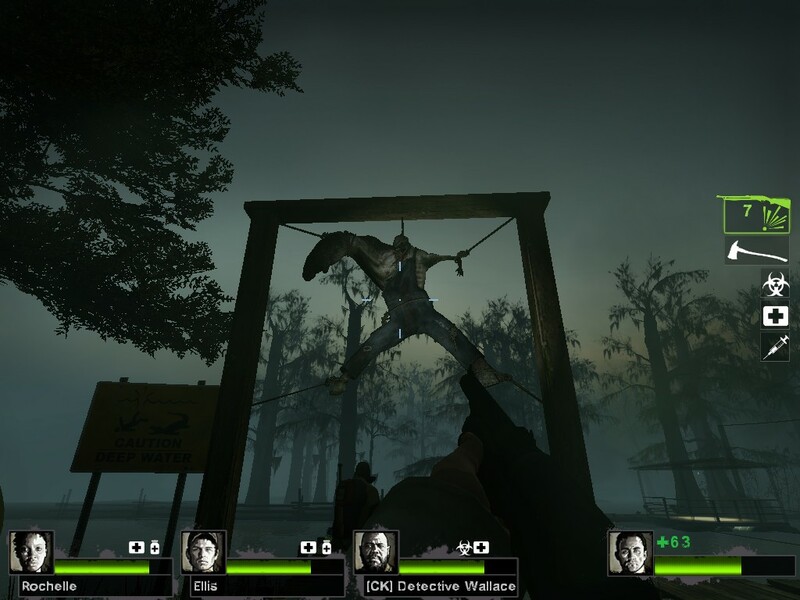 Unlike games like Left4Dead, where the player must commit himself to some sort of zombie genocide, Alan Wake focuses on presenting the protagonist with a small number of enemies each time, changing the types of enemies present and giving us a variety of "darkness-possessed" locals to slaughter. Alan Wake gives you types an interesting variety of enemies, from swarms of black birds (angry birds, no pun intended), murderous axe men, to even possessed furniture. In fact, at one point some trains decide to break apart and crush you. The human characters in this game that Alan interacts with really help the player feel as if this life-changing journey is happening to you. Although the characters are pretty cliché (such as the annoying/trigger happy FBI agent chasing you) Remedy brings out their personalities through detailed (sometimes lengthy) conversations the game makes you sit through. To add to it, there are tons of interactive objects in your environment including: doors you use your face to open, working radios, small power generators, flood lights, and even the occasional abandoned car. You run over the possessed too, its satisfying and saves you ammo. One thing that truly impressed me were the graphics that this game offered me. Even with the setting all set to low, this game was amazing to look at. With a decent graphics card, this game can sometimes drop your frame rates to as low as the 30-40 mark if you turn up your settings. The lighting and shadows in this game were phenomenal, photo realistic even. Every second of game play can be screenshot and used as a wallpaper. A nice pat on the back to Remedy Studios for producing this first-rate game, considering the small size of their company and this being their first game with horror elements in it. However, there are a few drawbacks in this spiralling adventure through the countryside. This included your ability to dodge attacks. What annoyed me the most was how precisely you must turn and back-peddle in order to avoid some axe from burying itself into your head. It was especially frustrating to try dodging the attacks from the enemies that threw axes and sickles at me. Aside from a flawed, but satisfying combat system, the placement of advertisements was irritating, the way every other vehicle was either a Lincoln, a Ford, or even how all your flash lights are all energizer branded. Nevertheless, Alan Wake was an awesome "Psychological Action Thriller" taking all the great aspects of an intense horror novel, comedy show and action game together, producing something very hard to put down once you've started. The game is divided into 6 episodes, each of them important, telling you the step by step process of rescuing his wife, and the rise of the Darkness, an evil that has awoken to take over the world. I would definitely recommend this game, as it presents you an experience difficult to find in any other game. I would definitely recommend this if you love puzzles, shooting, killing the possessed, driving or flash lights. If you have any comments or suggestions for future game reviews, please leave them below.